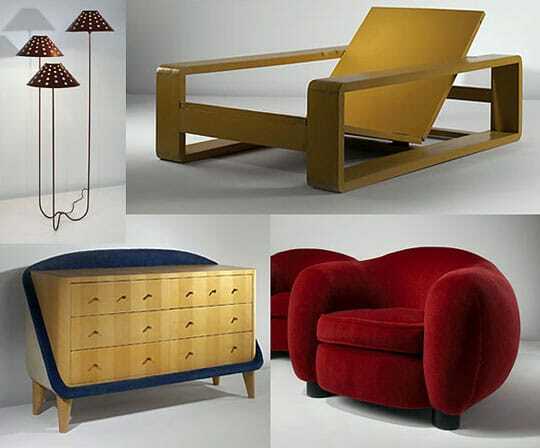 Mid Century Modern Design The Home of Tomorrow — When interior designers refer to “Mid Century Modern” design, they are referring to an aesthetic style based around the idea of streamlining everyday life using technology that was immensely popular in the 1950’s and 1960’s in the United States and Europe. After World War II, the industrialized nations of the world believed that the future success of their governments were heavily dependent on their ability to implement and adapt to changing technologies, and began to place a high emphasis on engineering, mechanization, and computer science. 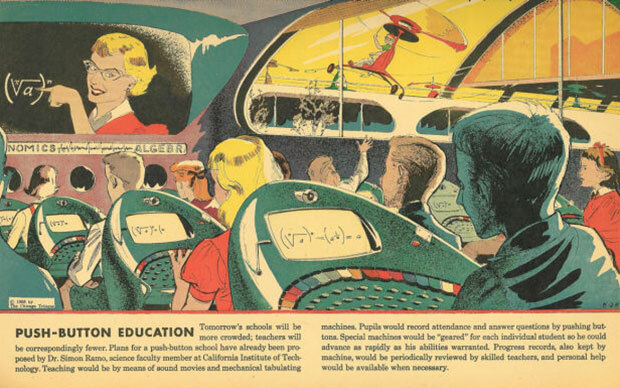 A magazine clipping, circa 1960, illustrating the proposed computerization of education. The effects of this shift are best illustrated by the so called “Space Race,” which refers to the U.S and the Soviet Union’s competitive goal of being the first nation to successfully send a shuttle into orbit, but the emphasis on new technologies extended far beyond the countries’ space programs: In Europe and America, a higher emphasis was being placed on teaching math and science to children, to prepare them to be future innovators. 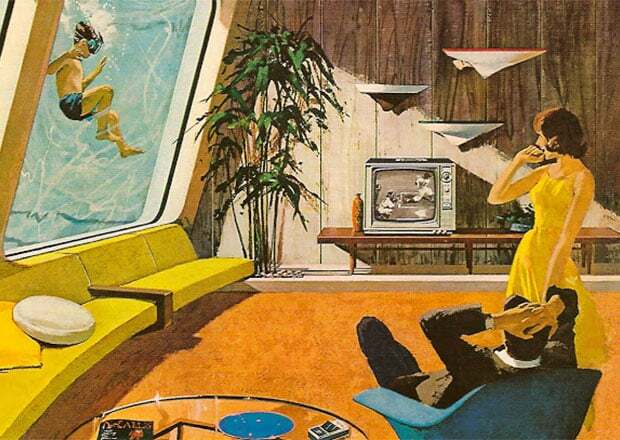 The American public was incredibly inspired by these ideas of a high-tech future, and the ripple effects of the Space Race echoed throughout culture: Almost every aspect of design in America was subject to a “modern” makeover, resulting in homes and domestic objects that looked like they were plucked straight from an episode of The Jetsons. 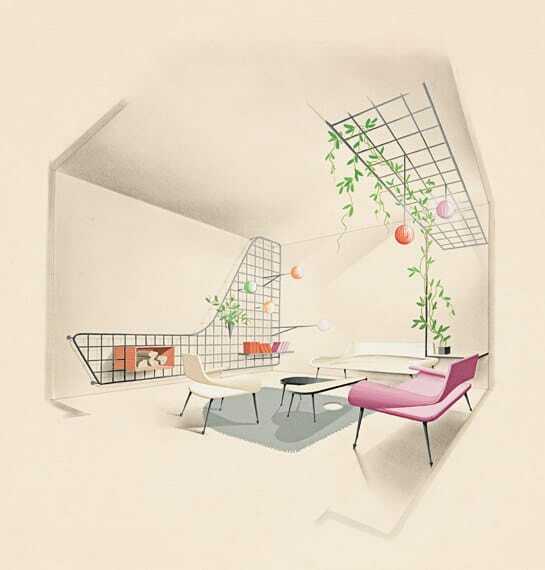 Illustration of “Home of Tomorrow” Design, circa 1960. Aesthetically, the mid century modern design craze was characterized by an emphasis on fabricating objects from futuristic materials, like chrome, lucite, and other plastics. “Martian” color schemes, including other-worldly, chemically produced hues like burnt orange, acid green, and luminous violet became de rigueur. Cars, home appliances, and furniture took on the smooth curves and aerodynamic lines of space shuttles. Even fashion started taking notes from NASA, with Haute Couture designers like Paco Rabanne, André Courrèges, and Pierre Cardin constructing luxury apparel fit for an astronaut. 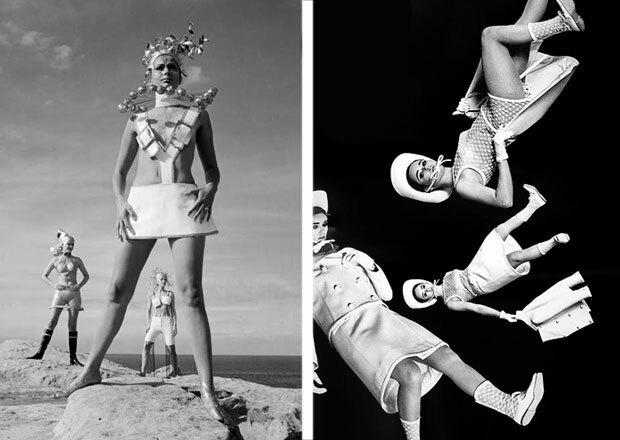 Space-Age fashion by Pierre Cardin and Andre Courreges. 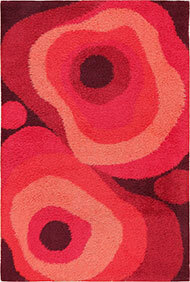 Carpets and rugs were not immune from the mid century modern design trend, and took color and patterning cues from the astronomical zeitgeist of the day: Mathematical tessellations, lava-like curves, and spacey bubbles and stars began cropping up in the rugs of the era’s most stylish homeowners. Jumping back to 2015, the Mid Century Modern look is experiencing a massive comeback in interior design. Perhaps it’s because we’ve entered a new Space Age of sorts, with the powers of the internet and computer technology digitizing almost every aspect of our lives; or, perhaps the curvy, minimalist style of the 1950’s and 1960’s simply goes well with contemporary designs, which also place an emphasis on graceful forms and user-optimization. 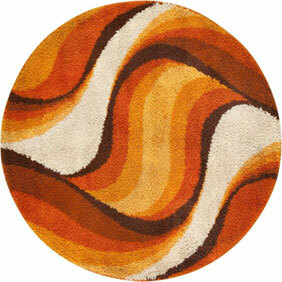 Either way, these beautiful vintage rugs look just as modern as they did when they first premiered, half a century ago. Jean Royère’s interior designs have an iconic history that matches the biography of the man. From humble beginnings as an banker, Royère earned craftsmanship credit before creating his own definitive style – one that became a favorite of the kings of the Middle East. From the Shah of Iran to Egyptian King Farouk and King Hussein of Jordan, Royère’s pieces could be found throughout the finest homes of the Middle East. The birthplace of antique Persian carpets, this affinity for mid-century design is perhaps unsurprising. 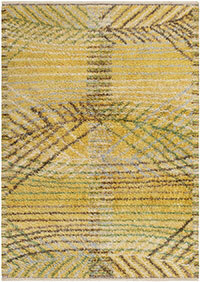 Decorative, pretty and playful, Royère’s style is a lighthearted compliment to the ornate formality of Oriental rugs. 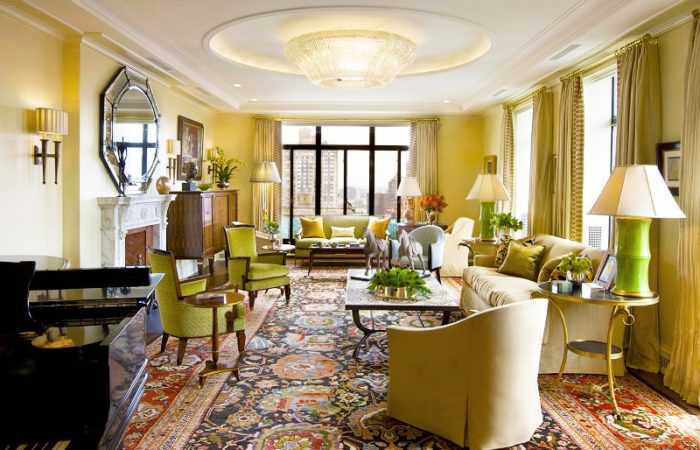 Florals, medallions and muted colors filled royal floors, but a Royère sofa or set of chairs brought the room to life. 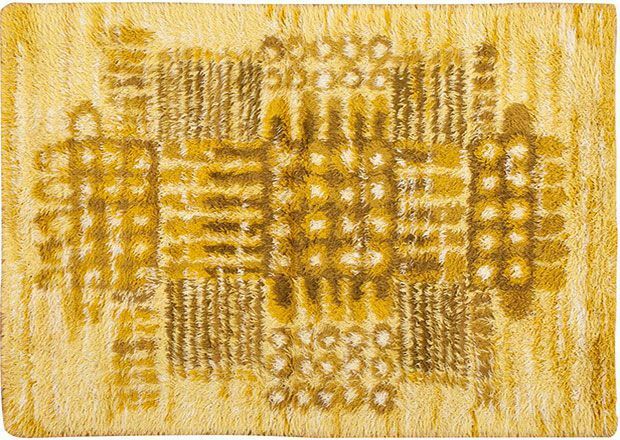 “The Royère style is a wonderful amalgam of bright, cheery colors, subtly organic forms and precious materials. Compact and fluid, robust and delicate, Royère’s chairs, lamps, chandeliers, sofas and desks exude a sensuous confidence, suggesting both comfort and alertness,” says the book Jean Royère, the latest retrospective look at the designer’s style. An exploration of the Royère style, the two volume edition will be unveiled on March 31 through Galerie Jacques Lacoste/Galerie Patrick Seguin. 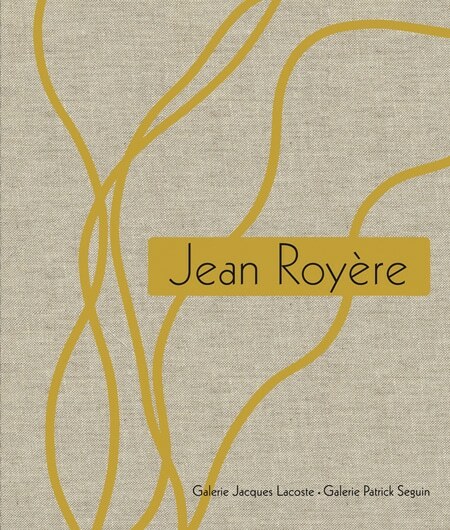 It includes interviews with designers, art historians and collectors who fell in love with Royère’s work. 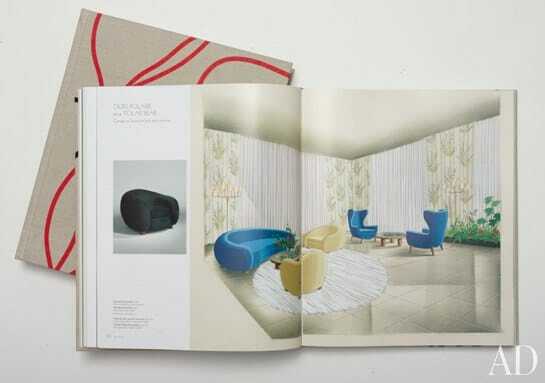 The majority of the book is dedicated to Royère’s most iconic pieces, with 380 items of furniture and other creations accompanied by detailed references. But the stand-out feature is the collection of previously unpublished Royère illustrations.